Kid Rock played golf with the president while wearing American flag pants on Saturday, and the fact that nobody is even remotely surprised by any of this is the surest sign that we are fully immersed in the America of 2019. Trump and Rock, a.k.a. Bob Ritchie, played at Trump International Golf Club in Florida. No word on who won, but we’re betting heavy on the president. Rock wore American flag golf pants, which was a bold fashion choice given the president’s affinity for hugging flags. It’s been quite a month on the links for Mr. Rock. Just a couple weeks ago, he scored his first-ever ace, and who else was in attendance but Jack Nicklaus himself. 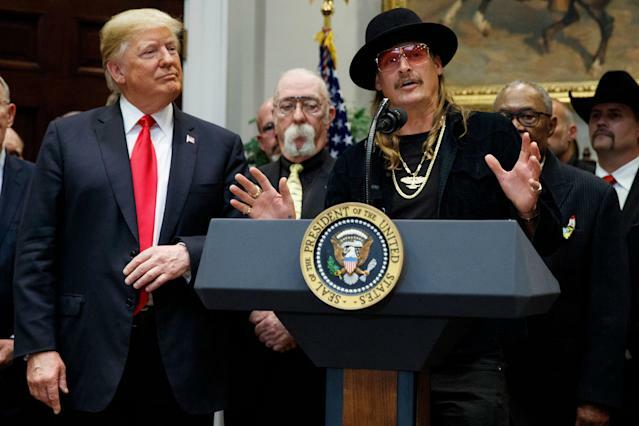 Expect Kid Rock to accept induction into Augusta National, the Royal and Ancient Golf Club of St. Andrews, and, eventually, the World Golf Hall of Fame in the coming years.